This is the story of your birth. I will tell it as best as I can remember. In my mind I can picture it clear as day because it is the day where my world opened up and I found my purpose. It was Saturday, March 1st and daddy and I were out and about all day running errands. We went to visit your grandpa Cal at work to pick up tickets to the local Nascar race (your daddy thought he was going to the race the next day…you had a different idea). We also went to Target (of course) to pick up some needed items and we went to Whole Foods for groceries and lunch. On our way home we stopped for frozen yogurt. I was content. We hung out in the late afternoon and took a nap on the couch. Around 6:30pm we started to get ready to go to dinner…we were going to try a new Italian restaurant near the house (Mezzo) we heard about. I wasn’t feeling great and actually thought I was having some gas pains. We decided to try and go to dinner. I continued to have these “gas pains” in the car and when we arrived at the restaurant I told your daddy I needed to just go home…something wasn’t right. When we got back home, I went to the bathroom and that seemed to jumpstart everything. I saw a bit of blood and knew this must be it. Daddy was in the living room putting together your swing. You see, we were sure that you were going to go past your due date of March 6th and didn’t think twice that this actually might be your grand entrance. The week before at work was very busy for me and I was running around like crazy…pushing carts full of binders, moving tables, doing credit checks, visiting classrooms…you would’ve never guessed I was due to give birth within days. Anyway, back to your day…I came out of the bathroom and told daddy. I think he was a little shocked and possibly in a bit of denial that this could actually be it. Daddy called the midwife, April, and she said it was the early stage of labor, that I should try and rest, and to start tracking the contractions for length and time between each one. Daddy took his job seriously and immediately started a chart with times. Resting for me at this point was not an option. My contractions started out about 15 minutes apart and they were pretty intense. Daddy decided to do a bit of video taping at this point. The contractions quickly got closer together and longer in length…and when I say quickly, I mean within 2 hours they were already 5 minutes apart. We couldn’t believe it! We hadn’t told people to come over because we thought it would still be hours of labor. Daddy called the doulas, Kim and Jollina, and April again. They were all shocked at how fast I progressed and started to make their way over to the house. I tried a few things to help me through the discomfort…I got into the tub, walked around, but the thing that felt best was to be on all fours crawling on the floor or sitting on the toilet if you can believe that. I would stretch one leg out to lengthen my abdomen and that helped a little. Jollina arrived at around midnight and I had another big contraction where my water finally broke. She said to me “Where do you want to have this baby?” I said “In the tub.” She said, “Walk there, fast!” You were coming. I got into the tub an immediately felt more relaxed. I feel like I went into this state…I wasn’t really paying attention to anything going on around me. Jollina would remind me to relax and let my body do the work (and it did). Occasionally I would come out of the fog and see Jollina’s face…she was so reassuring and seemed like an angel. Daddy and granny took turns sitting behind me and holding my hands. April arrived just in time and you were out within two more contractions. It was an amazing experience that is difficult to put into words. I remember before you came fully out, how everyone commented that you had so much hair. Your head was out and you opened your eyes under water and looked up. I immediately pulled you to my chest…it was so surreal. You were small and slippery but so beautiful and wide awake. You laid on my chest for a good 10 minutes as we let the umbilical cord finish pulsing nutrients to you. Daddy was so amazed at the whole experience. 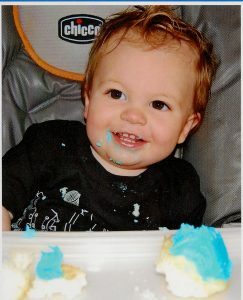 We had our baby boy…we prayed for you and God blessed us at 1:21am on March 2, 2008. It is a moment I will never forget. I write you this story as you sleep and each day I watch you change and grow and I continue to fall more and more in love with you. Now, my favorite time of the day is late into the night when you have fallen asleep at my breast. I can smell the sweet milk on your breath and you have that slight smile on your face as if you are dreaming of all that is good. These are the moments I will cherish forever and I look forward to the many more that follow.